Airparif is part of the French AASQA network (“Associations Agréées de Surveillance de la Qualité de l’Air”). The AASQA are a French non-profit association accredited by the French Ministry of Environment to monitor and study atmospheric pollution in ambient air. There is at least one AASQA per French administrative region. 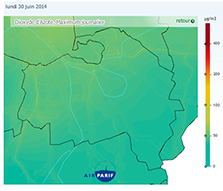 Airparif has four key missions: monitoring air quality over the Ile de France, which includes Paris and bordering departments, forecasting pollution episodes, informing authorities and the public and assessing the impact of mitigation measures. Air quality monitoring is performed through stationary measurements (automated stations) or sampling campaigns (mobile units or diffusion tube campaigns). Airparif also manages many other sources of information like meteorological data, traffic density, population density, digital elevation models (DEM), emission inventories. They also use deterministic models to predict air quality on a regional scale or near the roads. With the aim of producing more realistic maps, Airparif wanted to exploit this available information and integrate it in the mapping process. In order to improve map reliability and realism, Airparif was looking for a solution which helped them assimilate the station records in the mapping process and link them to the modelling output. Above all, they wanted to preserve in the process the key influence of the observed data, the one which presents a priori less uncertainty. Airparif has to inform the public several times a day of air quality forecasts over the whole region, and also more locally over urban areas. “We needed a software solution which could be embedded in a global automated workflow based on shell processes”, Head of Airparif Ambient Air Monitoring Service Pierre Pernot said. Airparif needs to produce highly accurate maps on several million cell grids. They were seeking a software package able to process such huge datasets in a quick and efficient way. Geostatistics definitely meets Airparif data assimilation challenge. It is an efficient way to incorporate auxiliary information (model outputs or any other secondary variables) in the final map by integrating the correlation between this information and the pollutant into the kriging algorithm. Today, Airparif uses five Isatis licenses for their day-to-day tasks. Airparif develops their own data processing systems to derive relevant information. 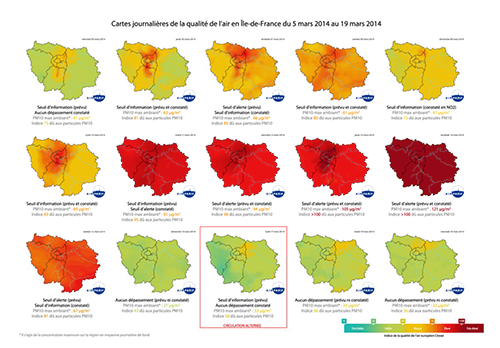 From this information, the organization builds on Isatis multivariate kriging algorithms to produce air quality forecast maps all over France on grids of more than 10 million cells on a 50m by 50m mesh. Resolution can even be finer for department-scale or city-scale maps. Maps are then enriched with logos and IGN background maps before being posted to Airparif website. “Isatis is fully in line with our data workflow. We use it as if it were a Geographic Information System”, Pierre Pernot explains. “Isatis can read a wide choice of data format. We take advantage of this feature to gather in the software all kinds of information derived from our many modelling tools”, he adds. Moreover, Isatis powers map production performances by offering powerful batch procedures that make it easy to set up production workflows and automate their execution. Airparif has embedded them in their internal shell processes to produce forecast maps several times a day over the whole of the Ile-de-France and each administrative division. Ten employees at the Airparif Study Division use Isatis daily in an interactive way to create and improve the workflows which are then used later to automatically generate maps. Isatis is also regularly implemented interactively for specific projects, for example air quality trend analysis over a region during a given time period. 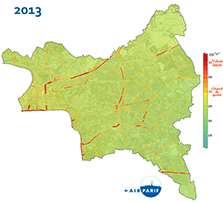 In 2014, Geovariances has been involved in the PREQUALIF project on the impact of Low Emission Zone establishment (for example a ZAPA, “Zone d’Action Prioritaire pour l’Air”). ZAPA are Priority Action Areas for Air aimed at reducing air pollution in urban areas when it exceeds the particulate matters (especially PM10) and nitrogen oxide (NOx) concentration thresholds. The project objective is to study how to set areas of restricted vehicle traffic and model the impact on people’s health. This project is being finalized.